Chris Detrick | The Salt Lake Tribune Bingham's Dason Youngblood (4) Brighton's Parker Gile (11) and Brighton's Tate Weichers (15) is guarded by during the game at Bingham High School Tuesday February 2, 2016. 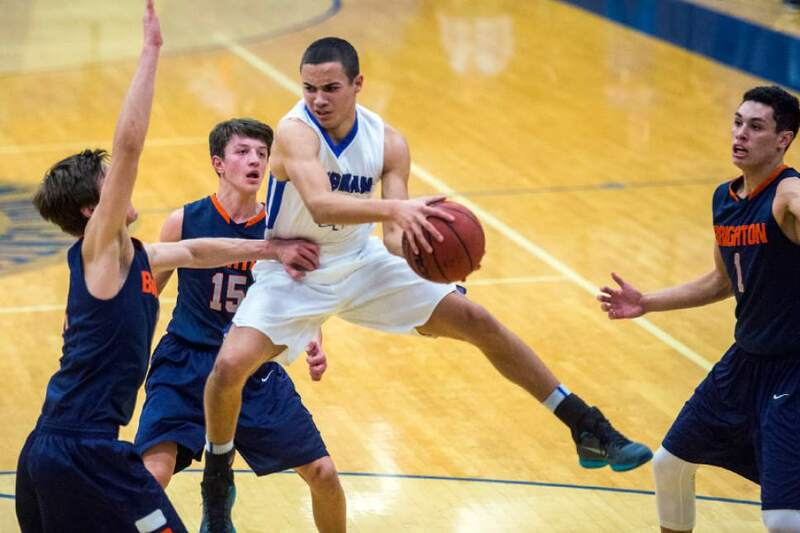 Bingham defeated Brighton 62-48. 1. Bingham (5-2) • The Miners lost some significant pieces from their championship run last season, but with the best backcourt in the classification, the road to the title goes through South Jordan. 2. Pleasant Grove (6-0) • The Vikings preseason schedule is very questionable considering they&apos;ve yet to play an opponent in their own class, but 7-foot-4 Matthew Van Komen is a force. 3. Copper Hills (5-1) • Stockton Shorts has played out of his mind to start the season. 4. Lone Peak (3-2) • The stars are gone from this program, but the Knights are still very capable. 5. American Fork (5-2) • As the third team in Region 4 in the top five in the classification, it shows the depth of the league. 1. Woods Cross (6-0) • Trevin Knell is a gunner, and Woods Cross has a very legitimate shot to have the best season in program history. 2. Corner Canyon (5-1) • The Chargers&apos; lone loss is against Bingham. This team had depth and an offensive identity, two key characteristics for a deep run in the postseason. 3. Timpview (5-1) • Region 7 is an extremely deep league, and Timpview has the pieces to win it. 4. Olympus (4-2) • It would be foolish to overlook the defending champions. 5. Hillcrest (6-1) • Could be the surprise team in the entire state right now. 1. Dixie (8-0) • The Flyers have won 17 straight games dating back to last year. 2. Ridgeline (6-2) • This could be a scary team with Jaxon Brenchley in the 3A ranks. 3. Juan Diego (5-2) • The Soaring Eagle have already registered some impressive wins. 4. Desert Hills (5-2) • After a 5-0 start, the Thunder have dropped two straight. 5. Pine View (7-2) • The Panthers are also on a two-game slide after a perfect start at 7-0. 1. Emery (7-0) • Not only are the Spartans undefeated, they&apos;ve hardly been tested yet. 2. Layton Christian (4-2) • The Eagles should be in the thick of things, as always, come season&apos;s end. 3. Summit Academy (2-2) • Somewhat of a slow start to the season, but the Bears are dangerous. 4. Waterford (5-2) • Big win against Beaver early in the year. 5. Enterprise (5-2) • True test against Waterford on Saturday. 1. Panguitch (7-0) • The Bobcats have yet to be challenged. 2. Duchesne (5-3) • Tons of parity in the classification, and the Eagles are right in the middle of it. 3. Valley (5-2) • Should contend in the toughest region in the class. 4. Piute (4-2) • Balanced club that should be competitive the entire season. 5. Merit Academy (4-1) • Strong start to the season. 1. Viewmont (7-1) • The Vikings are deep and can score in a hurry. 2. American Fork (7-1) • Region 4 is loaded, but AF appears to be the frontrunner for the moment. 3. Riverton (6-1) • Not too far behind the AF. 4. Copper Hills (7-1) • The Grizzlies are methodical on both sides of the ball. 5. Taylorsville (7-0) • Surprise team in the classification. 1. Alta (6-0) • The Hawks are stacked with young talent. 2. Wasatch (7-1) • Already at 7- 1 on the season, the Wasps cannot be ignored. 3. Judge Memorial (5-1) • The Bulldogs&apos; balanced approach could be a huge threat in the postseason. 4. Springville (6-4) • The Devils seem to be in contention every year. 5. Box Elder (5-0) • The Bees are undefeated, but have a tougher road ahead. 1. Carbon (8-1) • The Dinos can score points in a hurry. 2. Morgan (7-1) • Top team in the toughest region. 3. Juan Diego (4-3) • Don&apos;t judge this team on the win-loss record. 4. Desert Hills (6-2) • Representing the class from the south. 5. Richfield (7-1) • Should be a fun race in Region 12 against Carbon. 1. North Summit (6-0) • The Braves have been nothing short of impressive to start the year. 2. Emery (6-1) • The Spartans should contend for a state title. 3. North Sevier (4-1) • The Wolves and Spartans will duke it out in Region 15. 4. Millard (4-1) • The strong start to the season is a result of strong defense. 5. Providence Hall (5-2) • Very surprising team. 1. Panguitch (5-2) • The Bobcats are the premier program in the classification. 2. Bryce Valley (6-1) • The Mustangs will challenge in Region 20. 3. Wayne (8-1) • Top three teams all from Region 20. 4. Rich (7-2) • The Rebels have won a lot of close games. 5. Monticello (7-2) • The wins keep piling up for the Buckaroos.